Week 20 – Life, death and the power of mom. Let’s cruise to Alaska! Join Reid Tracy, president of Hay House Publishing, and me, for a once-in-a-lifetime cruise to Alaska. We’re offering our Speak, Write, Promote workshop from August 1st– 8th and you can learn all about the program and cruise here. Life, death and the power of mom. It’s a word that’s been on my mind lately. The death of Sheryl Sandberg’s husband, Dave Goldberg has stayed with me all week. Sheryl is the COO of Facebook, and her husband Dave was the CEO of Survey Monkey. Dave died while exercising on vacation. Maybe it’s the fact that he was so young and he and Sheryl were not only husband and wife, but seemed to be such good friends. Or maybe it’s because they were on vacation with their children and we all know the gyrations it takes to imagine, plan, and finally enjoy a family vacation. Whatever the case, this tragic story has reminded me to stay present and grateful for my life and the people in it. Which brings me to my mom. It’s Mother’s Day here in the States and today I’m grateful because my soul chose the perfect mother. My mom is an extraordinary woman (in spite of the fact that she’s probably reading this and rolling her eyes right this minute!). She’s fiercely protective of her family; addicted to sending thank you notes and funny cards with passages underlined multiple times; hysterical like Lucille Ball; and thoughtful in the way that every kid – young or old – should hope to be. Like many women her age, my mom’s not had an easy life. She married young, had seven children, and raised them practically on her own while my dad was busy working three jobs to feed our family. I have such compassion and respect for the life my mom’s soul chose to experience this time around. She was born in an era when women had very few choices. She had to become masterful at ignoring her desires in order to potentiate the dreams of her children. My mom has spent the majority of her life putting her needs on hold in service to the needs of others. And because of that, it can be like pulling teeth to get her to receive. When caregiving consumes a life it’s not uncommon to develop a kind of anti dependence in order to survive. The “I’m fine and I don’t need anything” wall becomes impenetrable and it can make it damn near impossible to insert a lifeline that can feed the heart and soul of someone who has sacrificed so much. But today, as we celebrate this special day, I honor my mom for her open-mindedness. We’ve agreed to work together in support of her getting a PhD in receiving. Right now I’d say she’s a freshman in the masters part of the program . Our journey here will end. We need to stay awake to this reality. The gift of staying awake to the reality of death is that we also stay awake to love. And speaking of love – I love you, Mom . And I send love and appreciation to every single woman who reads this blog because I know how much you give to others. 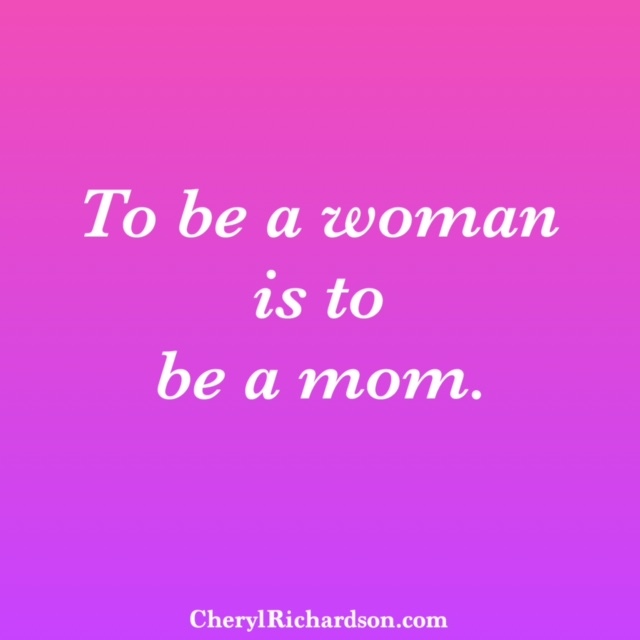 Because to be a woman is to be a mom. I like this week’s video because it speaks to the powerful influence a mother (whether biological or soul related), has on one’s life. You can watch it here.